Summary. The paper presents the effect of the Hévíz Lake sludge on health and beauty, with particular emphasis on the beneficial properties of the Hévíz sludge ingredient in cosmetics, which is mainly presented with the Kaviczky treatments applied in Danubius Health Spa Resort in Hévíz and the ecological unevenness of Lake Hévíz. Agnes Kaviczky developed the Pannon Formula, which is composed of Hévíz sludge, Hévíz water, natural grain extracts and biologically pure essential oils. The unique features of the Lake Hévíz, its therapeutic effect, its unique flora and fauna are of great importance for those seeking healing, beauty, relaxation and excursions. From an environmental point of view, the sustainability, protection, conservation of its living and healing sludge for future generations must be sought. Summary. The article concerns the phenomenon of control and illusion of control in financial decisions of Polish enterprises. The article identifies the main determinants of the illusion of control. The aim of the paper is to assess the level of control and the degree of illusion of control. For this purpose a CAWI survey was conducted on a group of persons employed in enterprises and responsible for financial decisions. The empirical part of the article presents an primary study conducted among financial directors which showed high results of surveyed entrepreneurs in the area of control and the observed phenomenon of the illusion of control in decision-making situations in the field of finance. At the same time, the main factors influencing the level of the illusion of control were verified. Summary. This paper focuses attention on the fact that the V4 (Visegrad) countries in general are poorly prepared to capitalize on the opportunities offered by the fourth industrial revolution, and less protected against the risks created by it. First of all economic structural indicators prove that the economies of the V4 countries are still not knowledge based, and can be characterized by low value added activities. In some cases Poland stands out with slightly better results, but all in all V4 countries lag behind the economically more advanced countries for all the analysed indicators. Secondly these countries do not invest enough into their human resources. The article suggests that unless the V4 countries start putting stronger emphasis on developing human skills and local knowledge they will lose a historic opportunity for becoming successful nations which are able to benefit from the ongoing processes of the fourth industrial revolution by moving up on the value chain. Summary. The idea of anonymous digital money existing outside of traditional banking system lasts at least 40 years. It appeared as soon as technological solutions, which such a system requires, became available. The article analyses the genesis of the crypto-currencies and technological solutions implemented into the Bitcoin digital currency. The article shows current state of the Bitcoin market and changes in its price, market capitalisation and number of transactions during last decade of operations of the crypto-currency market. Although there are difficulties in using Bitcoins, which include technical background and resulting from the high volatility of prices of this currency, the continuing upward trend of the Bitcoin price and the average daily number of transactions shows that interest in this currency is growing. Bitcoin features that attract new users are a large dose of anonymity, security of funds guaranteed by the extremely high computing power of the Bitcoin network, the speed of transactions and their low cost associated with the exclusion of a financial intermediary. The features of this money and data from the market allow to expect that Bitcoin will gain more individual and institutional users. Summary. Urbanization process in the Republic of Lithuania has formed a strong visual, cultural and economic gap between rural and urban areas. Lithuanian villages face major social, cultural changes and economic difficulties, which result in increasing migration of people to cities and foreign countries. Everyone could self-realize only in a safe and comfortable environment. The right environment, in which persons feel safe and are able to realize their potential in activities, can be created by spatial planning. Lithuanian scientists talk much about problems in territorial planning, but no particular proposals are offered and state institutions do not take any measures in order to stop this chaotic urbanization. There are a lot of problems related with land usage, so it is very important to create the sustainable model of land usage in Lithuania. Summary. The article presents the results of the analysis of factors influencing the development of the Mazowieckie Province (Masovia) in the years 2007-2016. Data for the study were collected from the Central Statistical Office and Statistical Yearbooks of the Mazowieckie Province. The results indicate that the level of development of Masovia is considerably higher than of other provinces in the country. At the end of the analyzed period, in Masovia the GDP per capita was almost twice as high as the national average. Masovia held the highest share in Poland’s GDP (22%). Important factors positively affecting the development of Masovia are: positive population growth and improving demographic situation, and broad access to telecommunications. Additional factors of the dynamic Masovia’s development are: extensive transportation infrastructure (104.3 km per 100 km2) and high number of students (236.5 thousand) and college graduates (60.8 thousand) who constitute the future substantive resources of the province’s economy. Summary. The article is dedicated to studying contemporary situation and problems of torusim brand development in Kazakhstan. The results of the conducted survey have shown that consumers are interested in such tourist-and-recreational resources as natural reserves and national parks and monuments, the Yassavi mausoleum, the branded direction – Borovoye and the mountains, as well as the symbol of the country could become the Golden man or the snow leopard. The research is based on authors own empirical research on the issues regarding tourists awareness and preferencess, as well as experts’ survey. The empirical research was provided based on literature review, primary data (in form of tourists surveys), secondary data collection, analysis and synthesis. To survey tourists a structured questionnaire was designed; 96 people were surveyed, including 55 women and 41 men as a random sampling. The experts’ survey was conducted in free form, and eight experts were surveyed. As was evidenced by the study results, international tourists are particularly interested in authentic cuisine as well as activities. Moreover, the research revealed that a gap between the way Kazakhstan officially defines its identity and the actual brand image the country has for now as a tourist destination. Summary. The demographic potential, especially in the peripheral and remote areas, has been deteriorating. Negative natural increase, low or negative migration balances, unfavourable values of the feminisation index and growing relation of the number of people at post-working age to the number of people at working age have been threatening rural development. The aim of the research was to show spatial concentrations of municipalities (LAU 2 level) with a similar level of demographic potential. The study was carried out for 2169 municipalities (LAU 2 level), including rural and semi-urban (urban-rural, including small towns) ones. It was based on the data from the Statistics Poland. The municipalities were are ranked by the level of demographic potential (by 4 variables) and put into 5 groups by the potential level using the taxonomic development measure of Hellwig. The results were presented in maps using cartogram method. The most favourable and promising situation according to demographic potential is observed in central and southern Poland, especially in semi-urban and suburban areas of large cities. The worst demographic potential level and at the same time the least favourable demographic forecasts concern mostly the Eastern Poland, already known as problem area. The spiral of negative conditions accelerates, causing more disadvantages, making young people looking for new places to work and live, deepening current demographic problems and leading to socio-economic development pathologies. Summary. A health care is characterised of creating an individual, specific relation between representatives of health care units and patients, which means that not only medical staff professionalism but also an empathetic attitude towards patients are important questions. Summary. Multi-Level Marketing is a kind of novelty in the business reality. The greatest popularity gained in Western countries, where it functions as a kind of hybrid method in distribution of the goods with the design of the sales network. It is one of the most secure business models. In Poland the awareness of this type of activity is still small and remains a wide spectrum of scientific research. This situation has led to the creation of this article. The aim of the publication is to highlight the problems of Multi-Level Marketing, an indication of the essence of this phenomenon, and show how far is different than traditional marketing. The article presents the system of functioning of this kind of business, how it works a system of charging commissions and indicated a practical example of this system. Considerations based on literature studies and case studies. First hypothesis research area: knowledge manager is a wizard synergetic and diversity of companies, second hypothesis research area: meteoric manager is provided through knowledge and be able to use this knowledge, Third research hypothesis: manager knowledge can be reflected in the form of a concept of material and the concept of an intangible asset. The development of a conceptual design and is based on the method of interpretation literature. Summary. The main purpose of the study is the role and influence of social factors on macroeconomic stability. The research is based on the hypothesis that countries with greater macroeconomic stability achieve greater social progress. The integrated index of human capital is proposed as a target for the construction of an appropriate system for monitoring social progress, and in the future – identifying the impact on macroeconomic stability. The main stages of estimating the integral index of human capital are: identification of relevant indicators that will form each of the sub-indices; filtering the selected indicators in the previous stage based on the analysis of the correlation matrix of each of the subindices; normalization of indicators in each of the subindices, calculation of the integral index for each of the subindices, calculation of the final integral index of human capital. The calculations of the integrated capital human capital index for some of the EU countries (Latvia, Lithuania, Poland, Croatia, Romania) and Ukraine for the period 2000–2015 allowed us to conclude that Romania and Ukraine were on a marginal level of social progress, while Lithuania, Poland and Croatia in the range of moderate level. The use of the OLS (the least squares) method to determine the significance of changes in social progress to macroeconomic stability has revealed a positive and statistically significant impact of social progress on macroeconomic stability. Key words: economic growth, unemployment, macroeconomic stability, social factors, European Union, Ukraine. Albania. Albanian producers are usually not able to penetrate into foreign markets because they are not part of consolidated marketing distribution channels. of knowledge, skills, and rudiments necessary for both, the purposeful point of view and active participation of a given person in social life. The low level of digital competences possessed is particularly visible among groups at risk of digital exclusion, in particular among people living in rural areas, the elderly and people with low education. The difference between people who have access to a computer and the Internet and people who do not have the possibility to use these devices is affected by the dynamic development of information and communication technologies. Digital exclusion is not only the lack of access to the appropriate infrastructure but also the lack of computer and Internet skills. In order to counteract the exclusion of these groups, activities aimed at developing social capital by strengthening digital competences play an important role. students of the Świętokrzyskie on individual economic areas. Method applied research area is anonymous questionnaire survey addressed directly using a survey to students study desktop and portable exams I and II degree. of spreading information about their products for enterprises active in the field of superfood products. Superfoods are products containing elements characterised by a wealth of nutritional values, e.g. chia seeds or goji berries. The article presents a short characteristic of social media and defines the eponymous superfood category. The research section of the publication analyses the Instagram activity of three Polish producers of food containing superfood elements, namely Chias – a snack producer, ZmianyZmiany – a producer of plant bars, and PowerWaters – a producer of water with caffeine. The current state of affairs with respect to Instagram profiles of the three discussed brands are studied comprehensively and several applicable recommendations are presented. The research also touches upon the issue of improving customer engagement levels as well as the issue of barter exchange as a way to increase sales and brand awareness in the virtual world. Summary. This research is try to identify the operational risks in Network Operation Center division of PT. IO; measure and evaluate the risks, as well as make control and response measures to operational risks. The research method was a survey and Focus Group Discussion, by using a questionnaire as a research tool. The sample selection is done by Quota sampling and Convenience sampling methods to the employees in Division Network Operating Center PT.IO, which has had experience of at least 5 years. The results showed that as many as 40 out of 49 identified risks have been handled properly. Against these risks, the company have 35 standard operating procedure documents (SOPs) as a mitigation of those risks. Nonetheless, efforts are needed to improve and update mitigation strategies because of the possibility of new risks and increased risk levels. It becomes a suggestion for further research as well as suggestion to undertake further research on mitigation at the division and director level. recovery of the country, ease of doing business. There is no obvious connection between the presence of foreign banks in the banking system and indicators of profitability, ease of doing business and financial stability of banking systems. This is confirmed by the correlation analysis of 45 indicators on the example of 26 European countries for 2009–2011 (the period immediately after the end of the global financial crisis of 2008–2009). It is proved that in the post-crisis period, for transnational banks, the decision of increasing/decreasing the volume of assets in the banking system of the host country is dominated by: 1) the structure of a complex financial crisis; 2) the speed of post-crisis recovery of economies and banking systems of these countries; 3) the effectiveness of the transmission mechanism of monetary policy in these countries. Summary. Turkey’s bio-diversity, geographical structure and climatic conditions, makes it possible to produce a wide variety of fruits and vegetables. Although, the high production capacity, half of the vegetables and fruits are lost during the supply chain processes from farmer to the end consumer because of the long and complex structure of the supply chain. At the same time the current supply chain structure leads to huge gaps between producer and consumer prices. The aim of this study is to determine the structure of the fresh fruit and vegetable supply chain in Turkey and develop alternative supply chain forms to prevent the “price differences” and “product losses” from farmer to the final consumer. The study included descriptive analyses with secondary data as well as literature review. In addition, this study emphasizes the asymmetric power relationship in the agricultural supply chain. The asymmetric power relationship is explained by the price differences between the farmer and the final consumer. The research findings suggest that the transition from the existing multi-intermediated supply chain to the non-intermediated model must be done in a gradual way and through strengthening of the farmers. Key words: agricultural supply chain, fresh fruits and vegetables, Turkey, restructuring of agricultural supply chains, food safety and food losses. level of competition in providing services, exhaustiveness of services, level of social significance, etc. A comparative analysis of the peculiarities of funding for education at different levels (primary, secondary education, post-secondary/total tertiary education) and funding sources (public and private expenditures) has been conducted. It is substantiated that the basis for determining the optimal financial support structure for LLS development should be the level of compliance of educational services with the criteria for meeting public and private goods. On the basis of this, it was found that the ratio of budget and extrabudgetary funding for basic education services should be 90 to 10%; for vocational education services – 60–70% to 30–40%; and for services of additional education – 20–40% to 60–80%. Key words: financial support, lifelong learning system, public goods, private goods. Summary. The aim of the paper is to improve theoretical foundations of the research of the population spatial mobility as an actual socio-economic concept and development of its three-dimensional model. Two basic concepts are used to understand spatial mobility – “mobility” and “space”. The population spatial mobility is suggested to consider its property, which reflects desire, willingness and opportunities to change a place of residence in specified space-time coordinates, which is accompanied by human potential capitalization during implementation processes. Immobility as the opposite property of mobility is identified. A three-dimensional model of the population spatial mobility is considered. The characteristics of the population spatial mobility are generalized. They include: subjectivity, level and scale display, tempology, transformation, goal orientation, potentiality, functionality, the ability to adjust and measurability. All the characteristics are described. The author points out that the methodology to determine the level of the population spatial mobility needs developing. The different types of the population spatial mobility are described in order to assess its level. This is active-mobile and passive-mobile population. The structure of the population spatial mobility is formed depending on the dominance of a particular personality type. The scale of spatial mobility as an important characteristic reflects desire, willingness and opportunities of movement for a specified distance. Functionality as the characteristic of spatial mobility reveals its ability to perform such functions as movement provision, stagnation resistance, balancing and alignment, variability, alternativeness, freedom, protection, development, self-responsibility and individualization. Goal orientation shows that the mobile property of a person allows them to more quickly meet the needs through the achievement of demanded goals compared to other members of society who are immobile. The actuality of the research of the population spatial mobility in the context of human development is proved in the conclusions. that the problems are systemic and result from corruption. The impact of the negative factors can be minimized in Ukraine, and monetary policy improved. Summary. The article presents the interactions between behavioral preferences of a leader and the factors of a high-performance team. A total of 476 interactions were identified using a cross-impact matrix featuring the behavioral factors of the leader and 25 factorial factors. On this basis, the most useful features of the leader are identified and the definitions of neuroleader and neuroorganization developed. Interacted studies have shown that the neuroleader leading the organization toward neuroorganization prefers behavior that is characteristic for people who are particularly developed in the right hemisphere (blue and green, in PRISM terminology). The article presents the characteristics of “blue” and “green” leaders. The results of the present research may provide an introduction to a broader study of the influence of behavioral characteristics on team performance. It would be revealing to conduct research on a larger number of companies in order to find correlations between high team performance and the behavioral preferences of team members and leaders. The author want to take up these questions in further research on high performance in neuroscience. These studies will enhance the knowledge of management, decision making and human behavior in teams and organizations. phenomenon characterizes the levels of human potential characteristics developed according to the environment of its formation, as well as public and personal needs. It is indicated that a structural approach should be used to study the quality of regional human potential. This necessitates the separation of certain levels of sociogenesis. Those levels include the human body, individuality and personality. Quality is formed at each of them. In this article, using qualimetry, a quantitative measure of quality was evaluated using the level of the human body. This was the basis for the premise that the quality of human potential is formed in a three-dimensional system of time, space and energy parameters, corresponding to the demographic, ecological and economic dimensions. Various indicators can be the characteristics of each of the parameters, depending on the research focus. Using the methods proposed, the quality of the human potential of Ukrainian regions was evaluated. Indicators of the degree of harmonization and the quantitative measure of the quality were calculated. It was established that analytical conclusions should be considered not only the grade of the quality achieved, but also the degree of harmonisation of internal and external factors. Do better socioeconomic features of population mean more competitive regions? introduces some national and EU programmes which are meant to mitigate the effects of unfavourable situations. reissue of land share lease agreements. Lessors, who are the owners of land shares, have to take their place in the market environment of agricultural businesses and in the system of agricultural marketing in general, since they both perform the functions of the key asset provider, i.e. the land bank and partially the consumer of products made by this business. surveyed. Although up to date there was a lot of research on international students’ motivations to study abroad, testing various push and pull factors models, and there is only one piece of research looking specifically at students motivations with regards to international branch campuses but at Arabic context. The gap created the opportunity for the present investigation. This paper is the first piece of research that examines international students’ motivations to select a European university branch in China. The findings indicate that pull factors could be more important in influencing students to study at international branches of European universities. Summary. 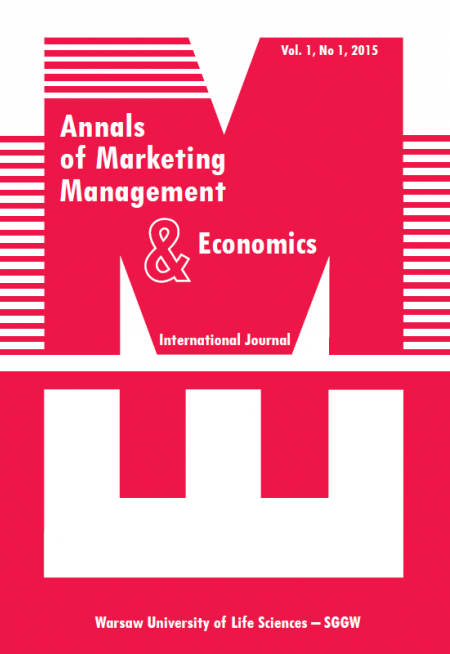 The article helps to identify interrelated factors of the formalization of brand marketing management using applied strategic marketing tools. The brand marketing management framework is constructed on the market research results – new marketing mix. Consequently, valuable brands and new food products are more successful in market at the lowest costs under more intensive promotional activity. Customers always fix their choice at an advantage in consumption of new brands with (in)tangible attributies – quality, use convenience, time savings, image or variety by personal experience. Producers try to gain from new brand marketing management and try to form new consumption trends together with intermediaries. The theoretical and empirical researches were provided on the basis of scientific literature, case studies, primary data collection, surveys, primary data analysis and synthesis. A questionnaire was used to identify brand marketing management tools and the results of using them. The answers to research problems are formulated on the base of situation in the B2B and B2C markets of food brands. The research was framed to demonstrate that the formalization of brand marketing management can be impelemented succesfully by forming target marketing strategy and marketing communication. Summary. The article studies the historical development of educational migration processes in Ukraine. It processes the classification of educational migration in view of global instability and manifestations of the crisis. It also suggests measures that should be implemented to prevent significant educational immigration from Ukraine. It also determines that the prerequisite for the educational migration is the desire of an individual to get certain education, which can be classified in terms of desired level of qualification, professional specialization, directions, methods and ways of getting education and the desired result. It is noted that a specific feature of educational migration is its impact not only on the profitability of the educational sector (or a particular university), but also on the economy of the country (region) that provides educational services in general. In addition, the consumers of educational services are a potential workforce of corresponding qualifications. In order to define characteristic features of educational migration from Ukraine, it was necessary to identify individual characteristics of such transferences; that is why classification of educational migration was done in view of global instability and manifestations of the crisis. To maintain and expand the reproduction of intellectual potential, it was suggested to use effective measures of educational and migration policy that would quickly adapt to the changes in the global economic environment. It is necessary to apply the mechanisms which could establish systematic movement of intelligence, capital, and information in two mutually symmetrical directions (into Ukraine and out of Ukraine). It is necessary to strengthen the competitive advantages of Ukraine in science, education and high technologies. markets and segments. This research paper aims at measuring brand awareness and consumer profile for different types of milk in Tirana. Through a set of face to face questionnaires, it is revealed that those in charge of purchases in the household are pretty aware of the vast majority of the milk brands available in Tirana market. They also give high evaluation scores to the most known brands. On the other hand, consumers’ profile for different types of milk (UHT vs. pasteurized or fresh) seems to differ based on some specific socio-economic variables of the household and the person in charge of the purchases. The consumers with the highest income and education level are more aware about food safety importance. Such consumers are leaned more towards purchasing UHT milk. (external, internal, image assessment), enabled us to optimize the dedicated tools for subsequent image studies, making it easy to see the changes closely, taking into account their direction. ZETO’s management board has received extensive material that, if appropriately used, will have a direct impact on showing the direction in which the company should be headed in the coming years. The opinions of institutional clients and employees will help to determine the strategy for future activities. Summary. The concepts of sustainable development and corporate social responsibility are intended to humanize activity. However, are the existing concepts sufficient for them to fully realize their place in the world and its ecosystems, and to fulfill these roles? Is it necessary to seek a new concept of human organizational development, one which would strengthen the roles of creator, innovator and coordinator with total respect for the laws of nature? The author points to the contemporary threats and the need to search for new ideas and a more sensitive interaction with the environment, organizations, society and nature. This is necessary not only in meeting the goals of sustainable development, but also for development that is renewable, energy-efficient, closed loop, coordinated with nature and respecting its laws – and even using them. International organizations should not only prevent violence and preserve human rights, but also support the integrated development of individuals, communities and societies. They would thus help prevent stratification while increasing awareness and stimulating creativity. Integral development covers everything and everyone, is complete and respects the constant changes occurring in dynamic space. The concept of integral development seems now closer to modern humanity. Integrity means the interplay and interaction between all the elements of a set (organizations, communities, businesses, workers, the environment, nature) and the common good. This is not merely an idea but an actual necessity. Integral development is human development, and its organization is compatible with nature. This means being aware of coexistence and need to improve. In the absence of one or the other of these, it would not be possible to speak of integral development. PEST analyses as marketing research methods and tools of Ukraine’s bioenergy market. The process of implementing marketing research in the biofuels market is investigated, and the impact of macro factors on the results of current and future activities of the industry is considered and evaluated. this paper analyzes a pilot study conducted with university students, who were asked about their movie consumption habits, focusing on the various influences and sources of information that have an effect on their decisions. followed by the dynamic macroeconomic growth years (2005–2007). The moderate growth years (2012–2015) exposed funds to the lowest risk. For the entire period the average and the median funds and the market were exposed to a similar amount of investment risk. Summary. The purpose of the present paper is to identify the particular use of marketing strategies for innovative products and to define the features thereof. Innovative food products can be defined as those made of unconventional materials, with the use of the latest technologies and new methods of processing and storage, and/or innovative tools of marketing promotion. In the paper I show that innovative strategy is a leading functional strategy of high-tech enterprises. It involves producing a comprehensive set of measures for improving technological aspects of the production process, changes in the company’s organisational structure, and the implementation of modern management technologies. The strategy requires companies to act consistently, which allows them to position themselves in the market. A change in strategy is a response to changing external conditions. Innovative food products belong to the FMCG market, which is characterised by tough competition and oversupply. Forming effective strategies, creating successful brands and profitable business activity in this market requires an approach tailored to this market. Strategies of leading brands in the FMCG sector include seeking out prospects in emerging markets, acquiring leaders in profitable and attractive segments and forming alliances with competitors. set up brand extensions and determine the dimensions of brand equity. To understand the factors shaping branding strategies, marketers must understand where, how much and in what way brand value is created. Success or failure depend on continuously monitoring the effectiveness of branding strategies and the appropriate use of brand extension, brand equity and opportunities that appear on markets. Summary. The paper examines the rates of return of three main types of investment funds in the period of from 2005 to June 2016. The analysis covers 120 equity, 55 bond and 60 mixed funds and is based on data taken from www.bossa.pl, www.analizy.pl and www.izfa.pl. The results of analysis indicate that macroeconomic conditions significantly shape fund returns, though the impact is diversified by fund type. Better stock market conditions benefit equity and mixed funds, and the periods of economic slowdown are favorable for safer funds, including bond and money market funds. For the entire period, equity funds achieved the highest returns, but with the highest risk. The opposite situation concerned bond funds. The average returns of every type of fund were higher than deposit rates – more than 50% of the funds outgained them. consumption of high-energy food is the cause of diet-related diseases, aggravating both household budgets and the healthcare system. Healthy eating habits and the elements of food production safety should be monitored by a food security system. Such a system should be based on permanent control of nutritional, health-related characteristics and the presence of harmful substances to minimise the risk of disease. The process of improving threat detection systems is based on scientific risk analysis, the results of which form the basis for comprehensive risk management in clinical nutrition. Understanding patients’ opinions about the importance of quality nutrition in public hospitals may be among the determinants for improved multidirectional activities and increase the effectiveness of safe clinical nutrition. This aspect plays an important role in health education. Summary. The Transatlantic Trade and Investment Partnership (TTIP) is a major trade pact created to further integration of the EU and US economies. In today’s low-tariff reality, the agreement concentrates on eliminating nontariff trade barriers between the states, such as the differing standards in the European union and in the United States for given consumer goods and services. Unfortunately, a number of barriers threaten ratification. The agreement remains far from implementation and it is hard to measure how the two sides would benefit from it equally. Summary. This article examines the concept of marketing mix for non-profit organisations. The authors suggest the use of “4Cs+people”, the elements of which include: consumer solution (mission, sphere of influence, role within the sphere of influence, representing common interests and advocacy, values for target audiences within the sphere of influence, goods and services offered for members, recipients and groups in the wider society), consumer cost (for members, volunteers, clients – service recipients, people and companies making individual financial and in-kind donations, organisations’ own employees, the mass media and legislators, employees of large international foundations and society in general), convenience (the place and means by which events are conducted), communication (advertisement, PR, communication strategy, communication style, how easily information can be found) and people (professionalism, attitude to people and job). We believe that this concept represents special features of the service sphere in general and of non-profit organisation operations in particular. Summary. The paper shows areas of CSR included in corporate strategy, including particularly philanthropy, which may be pursued by an external organisation. It also presents areas of corporate social responsibility, providing a background for the results of the analysis of secondary data concerning the importance of CSR for enterprise. The procedure for creating a CSR strategy is explained and the possibilities of pursuing philanthropic tasks by an external organisation are shown. Using own research (the analysis of websites of 125 corporate foundations in Poland in 2015 and the results of the survey of 46 managers from corporate foundations), author present ways of delegating philanthropic tasks to corporate foundations and how the tasks are accomplished. This article is intended for researchers studying CSR and also for company managers who think about philanthropy. Summary. The aim of the article is to examine the theoretical foundations of diversification strategy and identify the characteristics of its application in agriculture. The relevance of diversification strategy research is that its implementation allows additional income to be made, ensures financial stability for enterprise when demand for basic products fluctuates, and strengthens the competitive position in chosen markets. The importance for enterprise of implementing growth strategy is discussed, as is the economic essence of “marketing strategy”. Dynamic changes in the market force producers to review their activity and seek a more optimum development strategy. Diversification can be the optimal strategy when market conditions are uncertain. The article analyzes the essence and types of diversification along with the benefits and disadvantages of diversification strategy. As a result of the research, features of diversification strategy for the agricultural sector were analysed, the essence of which may be found in the unification of agricultural products with other kinds of activity. This is done to decrease the risk arising from receding demand for main agricultural products. The study found that the most effective and least risky strategy is vertical diversification, which involves obtaining a synergistic effect and reducing transaction costs (through the use of a single production chain from field to consumer). Summary. The article presents analysis of the determinants of consumer behaviours in the furniture market. Given the numerous factors that influence consumer behaviours, the author has decided to focus on the most important determinants affecting furniture purchasers’ attitudes in the Polish furniture market. The determinants are divided into indirect factors (economic, demographic and marketing) and direct ones. The he characteristics of furniture are also described. The publication is based on the literature and research conducted in the furniture market in previous years. Summary. The aim of the article is to assess the professional situation of women in non-governmental agencies in Poland. The study draws on data from Poland Central Statistical Office for empirical evidence. A review of the subject literature is done, and additional reports and published material from the Klon/Jawor Society complement the research. NGOs are a welcome manifestation of civic life in the European Union. In the development of the NGO sector, as in other sectors, the issue of diversity management, including equal opportunities for men and women, cannot be swept aside. In Poland there are tens of thousands of non-governmental organisations involved in sports, arts and culture, education, social assistance and healthcare. Biernat-Jarka A., Trębska P., The professional activity of women in NGOs in Poland, Annals of Marketing Management & Economics Vol. 2, No 2, 2016, 5-13. Summary. The aim of the article is to describe measures aimed at supporting organic orchards in the the RDP 2014–2020 and how that support differs from that offered by the RDP 2007–2013. Drawing on FADN data, the article presents the current economic situation fruit farms face and discusses the importance of subsidies for organic production for those farms’ incomes. The second part of the article examines the reasons the system of support for organic fruit farms was reformed and looks at the most important changes to the economic and legal determinants in the RDP 2014–2020 as they apply to the production of organic fruit farms. I assert that most of the new changes are justified and will allow real organic fruit farms to develop while also doing away with the planting of crops by farmers seeking merely to collect the subsidies for them. Gołasa P., Economic determinants in the support of organic orchards laid down in the Rural Development Programme 2014–2020, Annals of Marketing Management & Economics Vol. 2, No 2, 2016, 15-24. Summary. The aim of this work was to explore employee evaluation as they are used in organizations. The research method was a survey, and the research tool was a questionnaire. Results from the studies show that there is a discrepancy between employee expectations of the evaluation processes and their real effects. This can cause employees to feel a sense of injustice with regard to evaluations, which, according to research, is quite common. A lack of analysis of the evaluation practice from the organizational perspective was a substantial limitation of the research conducted for this article. Nevertheless, conclusions from the research can be used as pointers in creating and correcting evaluation systems in organizational practice. Jakubowska K., Organizational practice and employee expectations in the processes of preparation and implementation of evaluation systems, Annals of Marketing Management & Economics Vol. 2, No 2, 2016, 25-34. Summary. The goal of the article is to present the proposition of reform in the system of financing educational services by local governments, which could contribute to increasing the market share of private entities. Currently, the majority of educational services in Poland are provided by public institutions, which is contrary to the general trend towards liberalisation of economic policy and the privatisation associated with it. The article proposes an education voucher and presents one way to reform education, which would not generate any organisational problems for local governments and would not have a negative impact on public finances. 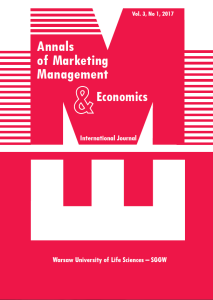 Jaroszewski T., An education voucher as a way to increase competitiveness in upper secondary schools educational services market, Annals of Marketing Management & Economics Vol. 2, No 2, 2016, 35-45. Summary. The concept of socio-economic development refers to the qualitative and quantitative measure of progress. The main objective of the study was to assess the level of socio-economic development of thirty-one counties of Wielkopolska province in 2014. A synthetic indicator based on TOPSIS (Technique for Order of Preference by Similarity to Ideal Solution), a multi-criteria decision analysis method, was used in the analysis. The statistical data were taken from the Local Data Bank of the Central Statistical Office. The counties were classified into four groups depending on their level of development. The study revealed that the most developed county of Wielkopolska province was Poznań county, while Koło county was the least developed. The socio-economic development in most counties of Wielkopolska province was at a medium level in 2014. Kaczmarek K., Evaluation of the level of socio-economic development in the counties of Wielkopolska Province in 2014, Annals of Marketing Management & Economics Vol. 2, No 2, 2016, 47-61. Summary. The aim of this study was to evaluate the influence of milk packaging on the buying decisions of university students in Ostrołęka county. The group surveyed consisted of 98 university students who purchased milk in Ostrołęka. The respondents were secondyear and third-year students majoring in business management at the Higher School of Economics and Social Studies in Ostrołęka. The respondents were selected by purposive sampling from the population of second-year and third-year students willing to participate in the study. Most respondents were of the opinion that milk packaging was neither a significant determinant of their buying decisions nor a major indicator of product quality. 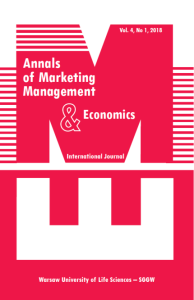 Kochanowicz Z., Balcerzak J., BórawskiP., The influence of milk packaging on purchase decisions of university students in Ostrołęka country, Annals of Marketing Management & Economics Vol. 2, No 2, 2016, 63-72. Summary. The aim of this article is to present the use of PRISM Team Performance Diagnostic to diagnose the team performance of the employees of an IT company. The article presents the different stages of team performance diagnosis with results and identifies possible solutions to the problem of poor performance of the team and the precise actions which should be taken by the leader. The teams managed with traditional methods never obtain high performance. The implementation of enterprise performance management tools using the PRISM Team Performance Diagnostic allows an organisation to build a high-performance team and achieve better business results. In companies using this tool, the involvement of employees, the company’s revenues, customer satisfaction and the level of customer retention can be increased from 1 up to 20%. Korzeniewska A., Wierzchowska K., Performance measurement and high team performance building using the Prism Team Performance Diagnostic, Annals of Marketing Management & Economics Vol. 2, No 2, 2016, 73-88. Summary. The development of rural areas is currently one of the more important priorities in the Common Agricultural Policy. In Poland, precisely drawn up rural development policy coupled with complex instruments have been implemented since Poland joined the EU on 1 May 2004. The aim of this article is to present the widely defined activities and measures implemented in the framework of the Rural Development Plan 2004–2006 and the Rural Development Programme 2007–2013. It also compares how they were shaped during the two financial frameworks. The article also presents the spatial absorption of the funds intended for their realisation and the beneficiaries by voivodship. Finally, the article defines the interdependencies between the amount of funds paid by voivodship in both of the programming periods. Mazur P., A comparative analysis of targeting measures and the absorption of funds under the Rural Development Plan 2004–2006 and the Rural Development Programme 2007–2013, Annals of Marketing Management & Economics Vol. 2, No 2, 2016, 89-109. Summary. The present article discusses the collaboration between the Maghreb countries (the region is defined in broad terms, including the member states of the Union Arab Maghreb – Algieria, Libya, Morocco, Mauritania and Tunisia) and the European Union in terms of economic development. Of essential importance is the year 1995, when the countries signed the Barcelona Declaration. One of its priorities was “(…) the creation of a free trade area, the aim of which is the gradual elimination of customs barriers (tariff and non-tariff) in relation to the trade of manufactured products. Partners also provide for progressive liberalization of trade in agricultural products and services (…)”. The Union for the Mediterranean and the European Neighbourhood Policy evolved gradually. The article examines bilateral documents (in particular in terms of financial assistance) and economic indicators such as the Index of Economic Freedom. Salamon J., The economic dimension of the EU cooperation with the Maghreb countries, Annals of Marketing Management & Economics Vol. 2, No 2, 2016, 111-120. Summary. The article examines the building of consumer values in the process of developing product innovations at various stages. Values are created in cooperation with the consumer in the process described. Customers may be included in two ways: first, it can be an interpretation of thoughts and a way of action being an expression of hidden needs that is the voice of the consumer, or, second, it can be through the concept of the lead user – which consists in consumers sharing their own suggestions and ideas during the development process. In both cases, including consumers in the innovation development process at its every stage increases the degree of acceptance of the finished product and the chance to satisfy the buyer, which in turn creates value for both the customer and the company. Szwajlik A., Creating consumer values in the process of developing product innovation, Annals of Marketing Management & Economics Vol. 2, No 2, 2016, 121-132. Summary. The aim of the paper is to compare the process of regional convergence in Poland and Ukraine, with special regard to its direction and dynamics. Regional convergence is widely discussed in the literature, and has gained in importance in the context of European integration, especially in the past decade. Less attention is devoted to the process of convergence of regions of European states which are not associated with the European Union. The authors attempt to fill this gap, in particular to the extent to which they devote attention to the processes of regional convergence in Ukraine. In the study the authors put forward the hypotheses that the processes of regional convergence in Poland and in Ukraine occur in entirely different economic conditions, and therefore their direction and dynamics differ significantly. The target period of the analysis covered the years 2004–2013, while the scope of this research was extended into the 1990s and described in the section of the article which presents the specifics of economic growth and changes in the three-sector structures, providing the context for regional convergence in comparable countries. 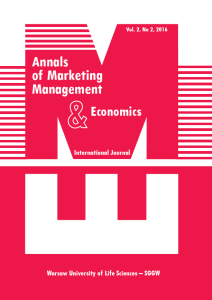 Żminda T., Bis J., Regional convergence in Poland and Ukraine after 2004 – a comparative analysis, Annals of Marketing Management & Economics Vol. 2, No 2, 2016, 133-151. Summary. This paper examines the capital structure determinants of Pakistan’s cement sector. The sample is based on 21 cement sector companies listed on the national stock exchange of Pakistan, the Karachi Stock Exchange (KSE). Debt/equity was taken as the dependent variable while independent variables were sales growth, profitability, financial cost, company size and tangibility. The overall results showed that financial cost and tangibility have positive relationship with the dependent variable. The three other variables growth, profitability and size are negatively correlated with leverage. Pervez A., An analysis of capital structure determinants using the example of Pakistan’s cement sector companies listed on the Karachi stock exchange, Annals of Marketing Management & Economics Vol. 2, No 1, 2016, 5-12. Summary. The article examines the influence of the Operational Programme Innovative Economy on individuals whose participation in the electronic economy is threatened by the digital divide. The aim was to diagnose the digital divide in the context of the Information Society and to assess the level of digital divide. The empirical material was a survey on a sample of 1,487 questionnaires, 1,402 of which were ultimately accepted and analysed. The sample consisted of individuals benefiting from the Operational Programme Innovative Economy – Measure 8.3, Counteracting Digital divide – eInclusion. The article presents the essence of the information society by looking at the ideas of A. Toffler, D. Bell, M. Castells, M. Bangemann and T. Goban-Class, as well as the nature of the digital divide and e-Inclusion. It was found that, after joining the programme, beneficiaries significantly increased their use of Internet encyclopedias (from 52 to 75.1%), as well as participation in online courses. Respondents also showed an increase in the use of electronic banking (the number of respondents who opened up an online bank account rose from 31.8 to 49.9%). Chalimoniuk D., Pizło W., The influence of the operational programme innovative economy on individuals at risk of the digital divide and their participation in the electronic economy, Annals of Marketing Management & Economics Vol. 2, No 1, 2016, 13-23. Summary. The main goal of the research was to show the European Union’s policy towards the regional development of the African continent. Recently, Africa has played a very important role on the international political arena and it has been empowered thanks to a plentiful supply of raw materials. The Communities’ help is based mainly on financial support and promotion of the Mediterranean area. Under the long-term cooperation between the two continents, many agreements, acts, and documents have been signed that would directly benefit the African states and indirectly help the entire European Union. While these documents and agreements cover a variety of matters, including environmental protection and human rights, they are diffuse and lack clear goals. The article relies on the relevant and current literature and a variety of statistics. Dobrowolska I., European Union policy for the socio-economic development of Africa, Annals of Marketing Management & Economics Vol. 2, No 1, 2016, 25-38. Summary. The article examines the changes that have been made to the direct payments system as a result of the most recent reform of the Common Agricultural Policy (CAP) for the years 2014–2020. It presents a model division of direct payment funds taken on by the countries and institutions of the EU, as well as changes to the national budgets and payments for 1 ha of agricultural land resulting from the redistribution and the ability to transfer funds between the CAP’s two pillars. It also presents solutions individual countries have used in choosing components available in the direct payment system and the division of national budgets allocated for their realisation. Results of the analysis show that the amount of direct payments in Poland has grown and that EU Member States have taken a variety of approaches to shaping the new national payment system. Kowalczyk B., Changes to the system of direct payments in the framework of the CAP reform for the years 2014–2020, Annals of Marketing Management & Economics Vol. 2, No 1, 2016, 39-51. Summary. The aim of the study was to research, analyse and evaluate preferences concerning the services offered by the Regional Olsztyn-Mazury Airport in Szymany. A questionnaire was used as the research tool. The researched groups were students and employees of the Faculty of Economics of Warminsko-Mazurski University in Olsztyn. Number of 1,136 people, accounting for 38.77% of the student body and employees, responded. Thus they were statistically representative. The theoretical part of the paper discusses air transport in Poland. Definitions and features of the air transport market are presented, as are the relationship between supply and demand for passenger transport services. Information about Polish airports is presented along with development trends of the airports and the role of the regional airports. The empirical section presents the characteristics of Regional Olsztyn-Mazury Airport in Szymany. Questionnaire respondents were described by gender, age, occupation and income. The preferences of the interviewees concerning transport services offered by the airport are presented. The research shows that a significant numer of respondents would be unwilling to use the services, though there are factors that could encourage them (lower prices and more services). The article also examines demand for a list of frequently visited destinations, the reasons for travelling, and the need to adjust transport services to demand. Łaguna T.M., Pawelec M., Drzazga M., Piórkowski M., Karpa A., Customer transport preferences in services offered by the regional Olsztyn-Mazury airport in Szymany, Annals of Marketing Management & Economics Vol. 2, No 1, 2016, 53-65. Summary. Creating international competitive intelligence is the foundation of an enterprise’s entry and existence in a foreign market. Good preparation for international trade and the exchange of goods and services requires intelligence to be collected and examined. An enterprise needs to determine sources of competitive intelligence as well as set up foreign market entry strategies and activities under the existing conditions. For that, it must know the nature and scope of international competitive intelligence. To understand the factors shaping business activities, it should also study the competition between local and foreign enterprises in a foreign country, commercial organisations and risk in price fluctuations. Michalski E., International competitive intelligence, Annals of Marketing Management & Economics Vol. 2, No 1, 2016, 67-78. Summary. Governments have different measures at their disposal to influence the car market and thus achieve particular goals. Indirect interventionism, thanks to i.e. environmental regulation, should include social welfare. The American automotive market is more than 100 years old and has been the subject of various regulations that have shaped its structure. The Big Three of the US car industry (General Motors, Ford Motor Company, Chrysler) has changed over the last 50 years into The Big Six, which now includes Nissan, Honda, and Toyota. Analysis shows how fiscal and environmental policies influence particular sectors. This should be a revealing lesson for Polish automotive market regulators, especially when we need to deal with our own problems, such as the high average age of vehicles. The article also describes government activity in rescuing a key national economic sector. The financial crisis of 2008 showed that market mechanisms are not sufficient. Possible further losses related to the collapsing car industry forced the government to take control of the bankruptcy of GM and Chrysler. Mutrynowski T., Regulatory determinants of US automotive market structure – an overview, Annals of Marketing Management & Economics Vol. 2, No 1, 2016, 79-89. Summary. This study points to the essence of appropriate differentiation among tax optimisation, tax savings, tax evasion and tax avoidance. It discusses criteria for choosing taxation forms for entities in the small and medium enterprise sector that do not have a legal personality (in other words, they are run by natural persons and pay personal income tax). It uses a case study based on actual economic data, taking into account applicable tax regulations. The study concludes with recommendations for entrepreneurs facing the dilemma of choosing the form of income taxation that is most appropriate for them, keeping in mind that tax planning is an element of the entity’s operating strategy. Nyk M., Tax planning for small and medium enterprises (SMEs), Annals of Marketing Management & Economics Vol. 2, No 1, 2016, 91-98. Summary. The Global economic crisis had an impact on tourism movement all over the world and especially on island territories. However, some island territories coped better with the effects of the crisis than others. Cyprus was one that saw tourists visits return to pre-crisis levels. The main aim of the article was to examine how Cyprus dealt with the global economic crisis. Three questions were here posed: First, is there a correlation between the changes in the GDP growth rate in the main markets that send tourists to Cyprus and the changes in the number of tourist arrivals from these markets? Did the actions taken by the National Tourism Administration and National Tourism Organisation, during the global economic crisis, increase the number of tourist visits to the island? Was there, during the period analysed, a correlation between foreign tourists arrivals and Cyprus’ GDP growth rate? The methods used in the article included statistical analysis as well as analysis of the literature and of strategic documents. A correlation between the changes in GDP from the main markets and the number of tourists visiting Cyprus from these markets was observed. Moreover the actions taken by the National Tourism Administration were only partly effective. The correlation between the changes in foreign tourist arrivals visiting Cyprus and the changes in Cyprus’ GDP was estimated as weak. 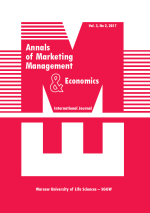 Podhorodecka K., The impact of the global economic crisis on tourism in Cyprus, Annals of Marketing Management & Economics Vol. 2, No 1, 2016, 99-110.
allow us to assess whether the country’s economy enables newly formed companies to survive more than a year or two, or if tends to close the door on them before they can fully develop their activities. The article also shows the types of barriers that are most burdensome for newly formed companies, and what should be changed so that Polish enterprise can grow. Soroka-Potrzebna H., Survival analysis of newly formed companies in the years 2009–2013, Annals of Marketing Management & Economics Vol. 2, No 1, 2016, 111-119. Summary. The article systematises issues concerning managerial skills development programmes dedicated to university graduates. Conclusions and recommendations have been collected to define key competencies and roles of people supporting participants as well as to establish a training scheme which allows graduates to move into their first managerial position. Recommendations are based on commentary from a case study done on a trade company analysed to define a development and conditioning programme for potential future managers. An important result was that such programmes reach out to young people preparing to hold a specialist or managerial position while also helping the organisation to provide good quality staff which realises the goals of the company. In other words, the analysis shows that the interests of both sides are consistent in career development. Moreover, the training programmes make it possible to realise the goals of the organisation. Szara A., Talent management programmes in the retail industry designed for university graduates, Annals of Marketing Management & Economics Vol. 2, No 1, 2016, 121-133. Summary. Sponsoring on the sports market should be treated not as a promotional tool, but rather as the act of building a relationship network, which is created and developed as the partners cooperate. Such a point of view brings about new challenges connected to managing a sports organisation and requirements towards positioning sponsoring in the marketing communication strategy of the sponsor to emerge in the context of expected effectiveness of all activities. The cooperation between a sports organisation and a sponsor requires a processual approach and the implementation of rules favouring the process of building a partnership. The process of managing the relations in the relationship network should be analysed on the strategy level, and consider the business and the expectations of each partner. Because those expectations can differ, and there may be a relative lack of desire to cooperate, which is rather common on the Polish sports market, managing a relationship network is a challenge that is difficult to coordinate. Waśkowski Z., Relationship management in effective sports sponsorship, Annals of Marketing Management & Economics Vol. 2, No 1, 2016, 135-144. Summary. The goal of this article is to analyse the main threats and benefits that accompany the implementation of age management policy, a method that enables workers aged 45+ to be highly effective. The article presents a demographic prognosis on the changing structure of human capital in the labour market, which determines the growing importance of age management in enterprises. The text contains an analysis of the key threats arising from a lack of employer action on age management, and the benefits that may be gained from age management policy. The article also examined the inevitability of changes, which will appear in the age structure of Polish people in the labour market and in companies. These particular changes will determinate plenty of consequences, mostly for employers, because the new personnel will require a slightly different management approach. My intention is to adapt the work to the requirements of the scientific community, as well as to the needs of labour market experts and business practitioners. This is why the paradigm of radical humanism was chosen for the article. Wychowaniec W., Age management as an opportunity to manage employees effectively in the light of demographic changes, Annals of Marketing Management & Economics Vol. 2, No 1, 2016, 145-153. Summary. The article examines the importance of all-year and seasonal outdoor markets in the supply chain of regional food with PDO and PGI geographical indications. The author elaborates on changes to sales levels and the structure of outdoor markets in Poland in the years 2004–2013. She looks at the role outdoor markets play in the food supply chain, including the supply of regional food, especially agricultural products. She used consumer surveys as a primary source of information and data from Poland’s Central Statistical Office as a secondary source. The article concludes with reflections on the possibility of developing direct sales of regional foods in Poland’s outdoor markets in the context of consumer expectations. Summary. The article presents consumer preferences on the milk market. The research was conducted on a group of 98 students studying management at the Higher School of Economics and Social Sciences in Ostrołęka in 2014. The research showed that the respondents are young and they pay the greatest attention to: quality, brand and price. The respondents buy milk every day or several times a week. The students ranked ease of purchase, product quality, and wide choice of products as the most important factors in their decision to buy a particular milk from a particular vendor. They also indicated the most important information on a container was the percentage of fat and the expiration date. Summary. The article highlights the importance of components of intellectual capital in developing the organisation’s strategy. Information and modern technologies are the key to effective implementation of the marketing strategy of the company. Summary. The analysis was based on data gained from scientific research done in 2010-2011 by the research team at the Marketing and Commerce Department at Nicolaus Copernicus University. The article describes and compares data on marketing conditions in Mazovia’s enterprises with data on Polish enterprises from the country as a whole. The main focus is a comparative analysis of chosen marketing activities and tools used by all the companies under consideration. The issues discussed are among the practical and theoretical aspects of contemporary marketing in Poland, especially in Mazowieckie Voivodship. Summary. The article presents the organisational and legal conditions behind a municipal waste management system. The authors reviewed the subject literature on the functioning of local government and public services theory, focusing on municipal waste management. The paper also contains acts governing international and national law. They define, in the light of the central hierarchy of waste, the types and magnitude of necessary measures to be implemented in this area. They cover both requirements of quantity and quality. Summary. In the region of Płock, which includes the city and the surrounding county, the right conditions for tourism to develop are in place. This is important for the city, as an ever more vibrant economic center, as well as for the outlying rural areas, for which, next to agriculture, tourism could play an important role in socio-economic development. Given that, the article presents an analysis of the potential of tourist assets, the level of development of the tourist infrastructure and the region’s transport accessibility. The analysis reveals disparities in terms of the saturation of tourist assets and tourist infrastructure facilities. The city of Płock is much more developed than the rural areas. However, for the Płock region as a whole, the rural and urban areas are complementary. A factor that negatively affects the development of tourism in the region is the poorly developed transport infrastructure, which somewhat limits accessibility. Improving it is utmost importance if the region is to develop its tourism potential and other socio-economic areas. Summary. The paper investigates what motivates Polish students to study in the UK. The research is based on Polish students who attended the University Global Fair in Warsaw, Poland in 2015, and were inclined to study at one British university in north-west England. The paper examines these students’ motivation for their choice and investigates their decision-making process in this case. According to the literature, two main types of factors influence students’ decision-making process: push and pull factors. Push factors are created by the students’ country of origin, and are the ones that persuade them to move abroad. Pull factors, in turn, are those which operate within the host country and encourage students to consider it as their new residence Though the UK is one of the main destinations to study for Polish students, little research has been done on this particular group. That gap created the opportunity for the present investigation, for which I interviewed a group of students. Their answers indicate that, contrary to what a number of other studies have suggested, pull factors could be more important in influencing Polish students to study at British universities. nature among civilian, officers and reserve or retired officers. It was found very important due to influence of motivation on, e.g. quality of school education or science researches. In order to indicate the main motivating factors to work in the university I used the results of diagnostic survey which was done among a representative research sample at the National Defence University (NDU) in Warsaw. Summary. Changes in consumer purchasing behaviours have become important, especially to companies operating on a global scale, which must understand the unique cultural qualities of each country and influencing factors of work. Every human being has different physiological, and biological needs. Although social factors have more influence on consumer needs in some countries, there are others in which religious, cultural and economic factors influence consumer needs as well. Hence, if companies wish to succeed, they have to evaluate consumer behaviours effectively and efficiently. There are a number of factors – globalization, national, religious, and family relations, to name a few – working to influence modern youths in the Republic of Azerbaijan. For this paper, we conducted a survey among 81 students at Qafqaz University, a prominent Azerbaijani private university, in order to identify their purchasing power and the factors that influence their decision-making. Summary. In the early 20th century, the pioneers of marketing theory attempted to define the scope of content of the new academic discipline of marketing. They looked at such concepts as functions, institutions, goods and, later, interregional trade. These approaches were considered an integral part of marketing as a whole. The paradigm shift that took place in the 1950s gave rise to many other schools: marketing management, marketing systems, consumer behaviour, macromarketing, social exchange and the history of marketing. A result of the growing fragmentation of the discipline was the increasing independence of individual schools, which focused mainly on their own narrow perspectives, neither attaching importance to the achievements of the remaining ones nor caring to integrate them into a coherent whole. Further development of marketing theory will require research focused not only on the managerial perspective, but taking into account the broader social and economic context. Summary. Marketing is responsible for the relationships between a company and its environment and corporate finance deals with the accumulation of financial resources and their allocation for the company’s purposes. The mutual interrelations between marketing and finance in an enterprise are present at the stage of marketing strategy development, in the course of its implementation and during the evaluation of its effects. All of the company’s marketing decisions have a financial aspect since they involve certain costs and bring in profits in the form of the company’s revenue. To gain a permanent competitive advantage, enterprises must foster cooperation between controlling/management accounting and marketing specialists. This cooperation should involve providing the marketing department with information acquired by analysing the financial reports (balance sheets, profit and loss accounts, cash flow statements) of the company itself and its competitors. Summary. In the present study, we discuss the role of private label (PL) in the context of the development of the independent automotive market (IAM) in Poland. We also seek to define a structural model for PLs, with regard to the IAM market in Poland. The article presents the results of the analysis of the literature on the subject as well as of interactive pilot research conducted among 80% of the IAM market in Poland. The research was conducted on 28 November 2013, during the 8th conference organised by the Association of Automotive Parts Distributors and Producers in Warsaw. In Poland, private labels are used most of all by trading companies. Independent aftermarket companies represent the sector of production and distribution. This difference is the result of decisions concerning the implementation of private labels in the automotive industry. Although the notion of private labels is known in the automotive industry there are barriers to introducing them nationally. The article presents the challenges and limitations of developing PL among Polish IAM entrepreneurs and proposes a PL strategy model. The overview and research results will allow IAM decision-makers to analyse the possibilities and threats that implementing private labels into their structures carries. As far as we know, the analysis and research presented here are among the first empirical explorations aimed at filling the IAM knowledge gap. Moreover, there is no comparative international research in this field, suggesting the need for further in-depth research. The analysis and research material makes the paper an original contribution to the development in this field. Summary. There is growing recognition that the standard approach to motivation, referred to as Motivation 2.0 is not necessary adequate for assessing the contemporary drivers for students and budding entrepreneurs. Some have argued that the concept of goal setting may act as much as an inhibitor as a motivator. This perspective on goal setting can, prima facie, be very relevant to the entrepreneurial educator. In this research exercise the contemporary thinking on motivation and motivational approached will be explored and applied to the development of entrepreneurial education curriculum development and pedagogic structures. Those entrusted with the nurturing and development of any innate entrepreneurial potential must ensure that the teaching and learning environment is dynamic and as individualized as possible. Key to any individualized delivery mechanism is a coherent understanding of motivational factors and activities. Effective curriculum development for entrepreneurial training demands an integrated understanding of motivators which must be driven extracurricular, while enterprise education continues to become embedded in educational delivery structures. This paper addresses these demands and acts as a primer for how this could be achieved. Summary. The purpose of this paper is to propose a framework that can be used to develop a clear and conceptually consistent, context-specific system for assessing older people’s satisfaction with the experience of food shopping. In particular, I suggest a method for identifying their satisfaction level with the shopping experience and discuss areas of satisfaction and perceived dissatisfaction in this segment of the population. I pose the question: “What are the areas in which seniors perceive dissatisfaction when shopping for foodstuffs?”. I also explore the influence of age and health condition on satisfaction levels. To identify satisfaction, 12 attributes of the internal and external store environments were reviewed by a sample of senior respondents, who were asked to rate the attributes for the food store where they regularly/most frequently shop. While the results indicate a general trend towards satisfaction, areas of dissatisfaction do exist, including with the aspects of price policy, internal store environment and staff courtesy. This suggests that retail managers should pay more attention to seniors, as not all older consumers perceive their needs to be satisfactorily met. Summary. The aim of the paper is to define the main effects, value and share of EU funding allocated in Poland under Operational Programmes 2007–2013(2015) in the transport infrastructure projects total, by different categories of projects as well as by individual operational programmes. Under all Operational Programmes 2007–2013 beneficiaries in Poland signed 2774 contracts for transportation infrastructure projects of a total value of 167.2 billion PLN, of which 98.5 billion PLN had come from EU structural funds, as of 31 December, 2014. Although 2774 transportation infrastructure projects made up only 2.7% of all contracts, they enabled the absorption of nearly 35% of total EU funding allocated to Poland in 2007–2013 and made up a significant share of 33% of the total value of all projects carried out in Poland under the 2007–2013 OPs. Summary. This article looks at the issue of the interdisciplinary approach to marketing. The purpose of this study is to present the contribution of various sciences to the creation and emergence of marketing as an independent discipline of science. The subsequent parts of this study are devoted to the relationship between marketing and related sciences. 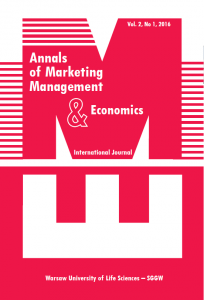 In addition, this paper illustrates a pioneering approach to marketing and the directions of its evolution, including the emergence of the extended concept of marketing. Summary. I take a good look at the happiness and the the factors that influence quality of life, such as the divorce rate, unemployment, trust, participation in civil society organisations, assessments of the quality of governance, and religion. I examine these factors in the Hungarian population, as a potential domestic tourist-target group. I also look at how happiness is defined and the happiness-generating characteristics of traveling in tourism. Overall, by means of my work I gain an overview of the psychological factors behind the decision-making of one target group doing place marketing.